In what was a rare mid-April afternoon of temperatures nearing 80-degrees and plenty of sunshine which was leading into a picture perfect night for racing turned out to be anything but that for Mahoning Valley Speedway. Despite the excellent forecast the paved ¼-mile had to cut short week number two after excessive flooding engulfed the track due to heavy overnight rain. Mahoning Creek, which flows along the back of the raceway, overflowed early in the morning hours and even after the rains had stopped and the creek receded some, it was still pushing water onto the surface through the drain outlets. That plus additional issues from weepers around various parts of the speedway made it a daunting task. Although track crews had been working since 6:00 am to pump out the water then calling in assistance from the Lehighton Fire Company to aid with the draining, the yeoman’s effort was futile, forcing management to cancel. “I can’t tell you how grateful I am to our track crew for all the hard work they did to make racing happen and also to the Lehighton Fire Department for their great effort,” said promoter Jack Carlino. “When we saw Saturday’s amazing forecast it had us all thrilled to put on this week’s show especially after such an amazing opener from the last week. We never expected to see the creek flood the way it did and it was very unfortunate on all fronts. But after last year with so many rain related cancelations we are incredibly resilient and will move on to next week.” With that it’s on to Saturday, April 20 as another six division program plus the season debut of the touring American Three Quarter Midget Racing Association TQ Midgets which kicks off their 63rd consecutive season will be presented. The regular classes on the night will be Modifieds, Late Models, Street Stocks, Pro 4s, Hobby Stocks and the first race of 2019 for the Sportsman Modifieds. The Dirt Mods have the night off. There is much anticipation to see Sportsman Modifieds as they will be running on the same tire as the Late Models as opposed to last season when they incorporated the same as the Street Stocks. The TQ Midgets bring a unique style of racing to Mahoning Valley with speeds like no other class. Start time is 6:00 pm. Front gates will open at 4:00pm. Adult grandstand admission is $14, $2 off for students, seniors 65+ and active military. Children under 10 are free. Pits will open at 11:30 am. Early paid practice ($25 per car) will be from 12:30 to 3:30. Regular warm-ups begin at 4:30. Pit admission $25 members, $35 non-members. Driver sign-ins will be from 3:00 to 4:15. Mahoning Valley Speedway got its 2019 season off to a rousing start with a great crowd, great car count and great weather and now it’s on to week two with another six division program taking place at 6:00pm Saturday, April 13. Matt Hirschman led the list of Opening Night winners with a 100-lap victory in the Modified headline race. However, the touring racer will not be back until later this season, leaving things wide open for a number of potential winners to step in as part off the weekly warriors. Reigning Late Model champion Frankie Althouse raced to his second straight Opener over top rival Mike Sweeney and with Broc Brown back in the mix as well as the usual top contenders it will be quite exciting to see how things play out this week. Randy Schlenker eked out a thrilling win in the Street Stock main over Jon Moser and Josh Mooney and given the equal level across the field, it should be much of the same this Saturday night. There seems no doubt that Ricky Yetter and Mike Stofflet will again be reckoning forces in the Dirt Mods, however, a pair of sophomore drivers in Corey Edelman and Colton Perry showed great form last weekend to make the always exciting class one that should see some surprising results. Jake Kibler, the defending Pro 4 titlist was once again able to open up the season with a win and the early season point lead. But, with the likes of Tyler Stangle, Cody Kohler and Bobby Kibler Sr., his stay at the top will indeed be a tough one. The Hobby Stocks as expected came out in full force for the 2019 lid-lifter and despite an inspiring run by Trisha Connolly, the open night laurels went to Shawn Kistler who made a late race charge to the checkers. This week’s action will get underway starting at 6:00 pm with heats getting things rolling. Front gates will open at 4:00pm. Adult grandstand admission is $14, $2 off for students, seniors 65+ and active military. Children under 10 are free. Pits will open at 11:30 am. Early paid practice ($25 per car) will be from 12:30 to 3:30. Regular warm-ups begin at 4:30. Pit admission $25 members, $35 non-members. Driver sign-ins will be from 3:00 to 4:15. Matt Hirschman opened up Mahoning Valley Speedway’s 2019 Opening Night the same as he left for the season finale Octoberfast 2018 by parking his No. 60 in Victory Lane. The talented driver who travels and wins throughout the Eastern Seaboard, came to the track that sits closest to his Northampton home, making the 30-minute trek a profitable $3000 one after he secured victory in the 100-lap contest. Hirschman would come from 8th on the 19-car grid, taking the lead from Earl Paules while engaged in heavy lapped traffic. He then had number of close restart battles with eventual runner-up Austin Kochenash but by the later stages it was clear the race was his to lose. Hirschman crossed the finish line several car lengths ahead of Kochenash for his 17th win at Mahoning, 13 of them coming in 100+ lap events. Kyle Strohl showed good strength late in settling for third while Todd Baer ran consistently steady in securing fourth. Anthony Sesely in his return to Mahoning after a number of years away rounded out the top 5. “It was a great night. The last several Opening Nights here I watched from the grandstands and this was a lot more fun for sure although a lot harder work,” said Hirschman, who was fresh off a win a week early at Richmond International Raceway and third consecutive. “I enjoy the traveling thing but it is nice to race close to home. We had a lot of supporters who came out tonight from many different states and we’re having a great start to the season but there’s a long way to go. I look forward to be back here later this year for a few more shows.” Determined by luck of the draw and leading the field to the green was two-time and defending track champion Brian DeFebo with Kochenash flanked to his outside. DeFefo would jump out front early on while Kochenash, Paules and Hirschman began a tight battle right behind. By lap 10 Paules was getting a good run on the top side and began reeling in DeFebo. Three laps later the leader had a glitch coming off turn four which allowed Paules to seize the lead. One lap later Hirschman was second and for the next 22 laps it was close action with that pair. With no cautions during that stretch lapped traffic became a factor and for the strong running Paules it would ultimately be his downfall after what appeared to be a very promising night. As lap 36 was recorded the leaders came upon a group of cars running two abreast. Paules was holding a line to the outside but just before clearing there was contact made after the car of Nick Baer shot across his path due to a bump that he received. Paules wound up spinning while miraculously Hirschman stayed low enough to just barely avoid the situation. “My eyes where definitely looking out the right side and it was just one of those things were we caught some lapped cars that were racing ahead of us and they were telling them on the scanner to try and get signal file but it didn’t happen and unfortunately for Earl (Paules) he kind of washed up some and got clipped. I just missed him and I’m glad we did otherwise we would have been wrecked too,” explained Hirschman. When the field was reset Kochenash was now second and through a series of restarts he made some valiant attempts to sneak underneath Hirschman for the lead, successfully doing so on one of those tries only to be thwarted on the ensuing lap. “I knew on the restarts I felt pressure from behind and we got a little crossed up a couple times but once we got going the car was great but you can never let your guard down here at Mahoning,” said Hirschman. It would be perceptible over the final 25 tours that Hirschman had a lock as he was hitting his stride with each passing lap. For Kochenash he showed that 2019 has the makings of a rewarding season as he ran the entire race from no lower than third. “We just ran the tires off near the end and the clutch began slipping early on so that hurt quite a bit and it just didn’t play out today. Second (place) is not bad and well get some money and go on to the next one,” said Kochenash. For defending Late Model champion Frankie Althouse, his Opening Night win wasn’t just a repeat of the previous year that was the springboard to his title run, it was also a bit of good relief too as heading into the season he had dealt with some personal team issues and getting the win was very relieving in many ways. The 25-lap event would run caution free and during each of those laps it was a torrid showdown between Althouse and two-time champion Mike Sweeney. Althouse had to be very shielding in keeping his place as Sweeney put quite the pressure on. Also making a strong presence was talented Broc Brown who would closely shadow the pair before settling for a respectable third. Dirt Mod winner Ricky Yetter was actually questionable on coming out to race as all week long he was battling the flu. However, with some proper medication he not only made it to the track but took the best remedy to overcome his malady by scoring a hard fought victory. Yetter started from the pole but afterwards was being hounded by champion Mike Stofflet. Nose-to-tail they would battle until the final lap when Stofflet went for broke and attempted to move underneath Yetter for the lead and win. With not enough track space to pull off the pass, Yetter kept his line while Stofflet looped his car which allowed Corey Edelman to gain a career best second. Mahoning Valley Speedway began a new twist in celebrating the season-long driver accomplishments as promoters Jack and Rebecca Carlino staged the first ever “Party in the Pits” which payed honor to the 2018 divisional champions and top point finishers while using the casual festive event to usher in 2019 that takes place this coming Saturday, April 6. Held on the final weekend of pre-season Test and Tune days, the Party in the Pits saw over 250 guests stick around afterwards to pay tribute to the past season’s champs and more. Brian DeFebo Racing was awarded his second consecutive Mahoning Modified trophy, earning the top prize over Bobby Jones and Kyle Strohl. DeFebo was the top feature winner in ’18 with five and among those victories included his 100th overall verdict. With this championship DeFebo now has 8 overall, six others coming at Evergreen Raceway. After a number of years settling either runner-up or a top-3 point finisher, Frankie Althouse finally procured his first driving title in nearly 15 years of running at the paved ¼-mile oval. Althouse fought right down to the wire with two-time and defending champ Mike Sweeney as well as top class winner Jeremy Miller.After a few years hiatus, former Street Stock Titleist Mark Deysher came back into the fold in 2017 and when 2018 rolled around he maintained a strong focus on regaining his championship form from 2001 and 2006. And, that he did, keeping himself among the champion contenders all year long, picking up his 21st career feature win along the way and edging out Cody Geist and Jared Ahner for title number three. 2018 was the debut of the Sportsman Modified class and it was filled with a great mix of veterans and up and coming talent. Although the division ran a limited schedule, the drivers showed the potential for growth. After all was said and done it was a very familiar name that would be honored as champion when 15-year old Austin Beers, who the previous year was fresh off a Hobby Stock title, picked up the top hardware. Young Beers, son of multi-time Modified champion Eric, was faced off against a prominent star in gaining the crown, beating standout Earl Paules for the elusive top prize. Beers ended the year with a class leading four wins and would finish in the top-5 in each feature held. Michael Stofflet proved unequivocally for a second straight year that he was the man to beat with the Dirt Mods. In 13 races held Stofflet won 8 times and despite a solid resurgence with car counts and competition, he was very fast week in and week out, failing only once to not make the top-5 by the end of each race. For Jake Kibler, nearly 20 years of racing for a title came to fruition as the sly and cagey veteran picked up the Pro 4 crown in what was a great season-long battle between him and former champ Cody Kohler. Both drivers dominated the win column with four for Kibler and five going to Kohler. However, Kibler had the better of them in top-5s which would ultimately be the deciding factor for his long-overdue accomplishment. For decades the name Wambold has been at the forefront of champions and winners at Mahoning Valley, most notably by legendary George Wambold. In 2018 the Wambold name made a triumph return to the top of the rankings as his son, Michael Wambold, who despite going winless, raced his way with the mark of consistency to the Hobby Stock title just ahead of Ryan Berger and Al Arthofer. After the class trophies where handed out a number of special awards were presented which included the Checkered Flag Fan Club Service Appreciation Award to assistant race director Frank Hoffman. The Rookie of the year recipients where @Kristy Arthofer, Samantha Osborn, Matt Schlenker, Corey Edelman, Josh Kuronya and Peyton Arthofer in the Modifieds, Late Models, Street Stocks, Dirt Mods, Pro 4s and Hobby Stocks respectively.Sponsored by Ahner’s Plumbing and Heating of Palmerton, the Best Appearing Car honorees where Kyle Strohl, Modified, Frankie Althouse Late Model, Jared Ahner Street Stocks, Avery Arthofer Sportsman Modifieds, Mike Stofflet Dirt Mods, Randy Schaffer Pro 4 and Al Arthofer Hobby Stock. In the Most Improved Driver category it was Joey Jarowicz in the Modifieds with Kenny Hein in the Late Models, Billy Sittler Jr., Dirt Mods, Ken Erney III with the Street Stocks, Randy Schaffer, Pro 4 and Hobby Stock Al Arthofer. The focus now moves to this coming Saturday, April 6 at 6:00 pm for the 2019 lid lifter headlined by a 100-lap/$3000-to-win Modified feature. Also on the slate will be Late Models, Street Stocks, Dirt Mods, Pro 4s and Hobby Stocks all running heats and features. Pits will open at 11:30 am with early paid practice from 12:30 to 3:30. Regular warm-ups start at 4:00 and heats at 6:00. The Modifieds will have a four tire rule in effect. The top-3 finishers from each heat will redraw for feature starting spots while the other divisions will start heads-up from their respective heats. Front gates open at 4:00 pm. Saturday March 30th starting at 5 pm…dinner served at 6 pm. Tickets will be available to purchase at the track on March 2nd & 3rd + March 9th & 10 from 12-3 pm. Arrangements can be made for those that live a distance away. No tickets available at the door. Overnight Camping in the pits with breakfast served in the a.m. for anyone interested. Open to drivers, their families, friends and fans. Since first being announced about the Mahoning Valley Speedway/ Evergreen Raceway Small Car Enduro Series, much anticipation has been growing for the special 9 race series between the two eastern Pennsylvania asphalt tracks and at month’s end the initial race will take place when Evergreen will host the opening round on Saturday afternoon, March 30. Nine races, alternating once a month per each track, will make of the series. Each race will award $500 to win, with 2nd, 3rd, 4th and 5th receiving $300, $200, $150 and $100 respectively. Points will be tallied for each driver and the top five in the final standings will be awarded the same payout. In order to be eligible for the final point fund payout competitors must run a minimum of 3 Enduro’s at each track. History will show that both tracks have always had a solid following of Enduro racers, many of them who take in each facility. Harry O’Neill closed out 2018 with back-to-back wins at Evergreen and then Mahoning Valley. Matter of fact a number of drivers have claimed victory at both the 1/3-mile Evergreen Raceway and ¼-mile Mahoning Valley Speedway. The series is open to all 4-cylinder, front wheel drive Enduro cars. Rules are posted on each of the tracks websites. Each track has other racing events slated for all of the aforementioned dates as well. Eastern Pennsylvania’s two paved short tracks, Evergreen Raceway in St; Johns and Lehighton, Pennsylvania's Mahoning Valley Speedway, took advantage at the 2019 PPB Motorsports Race Car & Trade Show in Oaks to announce a special Enduro Car Series to be held between the two facilities during the upcoming season. Both tracks have had a supportive history of Enduro races over the years and many of those who compete race both speedways. That led to a sparked interest and the concept of the Mahoning Valley Speedway/Evergreen Raceway Small Car Enduro Series. Nine races, alternating once a month per each track, will make of the series. Each race will award $500 to win, with 2nd, 3rd, 4th and 5th receiving $300, $200, $150 and $100 respectively. Points will be tallied for each driver and the top five in the final standings will be awarded the same payout.The series kicks off on Saturday, March 30 at Evergreen. Then it’s on to Mahoning Valley on Sunday, April 28. Sunday, May 19 race No. 3 moves back to Evergreen. On Sunday, June 16 Mahoning welcomes back the show for round 4 and then Evergreen on Sunday, July 21. The series stays at Evergreen for a Sunday, August 25 event while Mahoning gets a reappearance for the next two on Sunday, September 15 and Sunday, October 20. The conclusion of the inaugural twin-track outing will be Saturday afternoon, November 2 at Evergreen. The series is open to all 4-cylinder, front wheel drive Enduro cars Each track has other racing events slated for all of the aforementioned dates as well. Mahoning Valley Speedway rolls into the 2019 season headlined by the Modified class as the main attraction with a 100-lap/$3000-to-win feature on Opening Night, Saturday April 6. Also on the slate will be Late Models, Street Stocks, Dirt Mods, Pro 4s and Hobby Stocks. Race time is 6:00 pm. Mahoning’s season, which heads into the second year under owners Jack and Rebecca Carlino, will run weekly through mid-October. The Modifieds will have a number of other big-paying shows across the year including the season ending Octoberfast 150 which will award the winner a cool $5000. All of the aforementioned classes will also see extra-distance and added payout races during the year. Most of the special features, including the Modifieds, will be “cone races” for an added twist of intrigue. After a re-examination of the Sportsman Modified division, which at the end of last year was temporarily suspended, the class will be back in ’19 but will now run the same track tire as the Late Models that most feel will be a positive in improved competition. The Sportsman Modifieds will see action every third week beginning on April 20. New this season will be a special Enduro Series between Mahoning Valley and Evergreen Raceway. Nine Small Car Enduro’s will run once a month alternating between the two tracks. An overall champion as well as top point earners will be crowned after the final Enduro in November at Evergreen. All of the Enduro’s hosted by Mahoning will be Sunday afternoons. Each Enduro race will award $500 to win, with 2nd, 3rd, 4th and 5th receiving $300, $200, $150 and $100 respectively and the top five in the final standings will be awarded the same payout. The touring American Three Quarter Midget Racing Association will visit on three occasions. Also making a return will be the All-Star Slingshots and Jr. Slingshots on April 28 and June 16. Both will be run in conjunction with the Sunday Enduro’s. The April 28 Slingshot feature will be a National Tour event. The newly formed East Coast TQ Midgets will be on track for a number of select Sunday’s, sharing the billing with the Enduro’s. After a tryout at the end of last year to bring back the popular “Run What Ya Brung” track management will again close out the year with that event on October 20. Details on the specific classes are still in the works. Pre-season practice days are scheduled on March 16, 23, 30 & 31. The first Annual Party in the Pits will be held on Saturday, March 30 beginning at 5:00 pm. The event will be a special celebration of honor to the 2018 champions and respective division point finishers and serve as the kick-off to the 2019 season. The specifics are being finalized and will be outlined in short order. For a complete look at this year’s schedule of events please log onto the official Mahoning Valley Speedway website at www.mahoningvalley-speedway.com or on Facebook at Mahoning Valley Speedway. 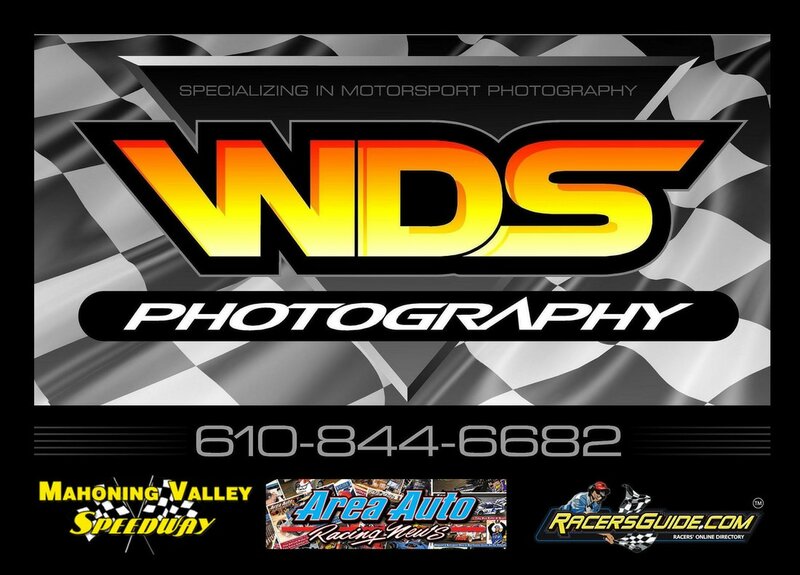 Mahoning Valley Speedway is located on PA route 443 just a few miles west of Lehighton.